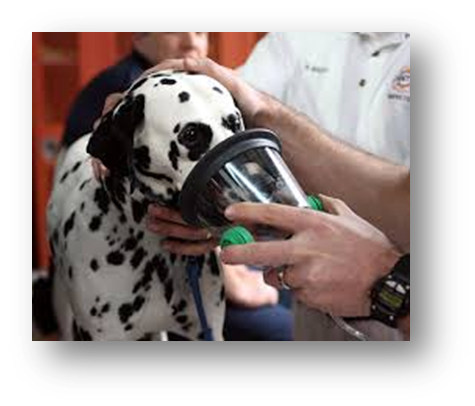 Every year thousands of pets are affected by house fires and other immediate emergencies or disasters. As a result, Countryside Fire Protection District is happy to sponsor the Save Our Pets Program by providing pet owners with a FREE static cling for their home. 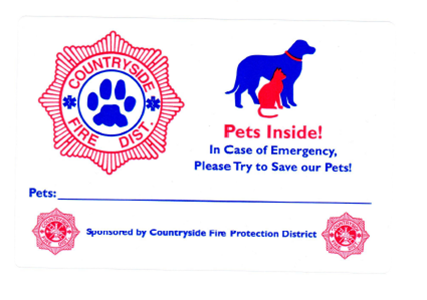 These door/window decals are designed to alert our firefighters and other responding personnel of pets being inside your home and allow us the opportunity to attempt to save your pet in the event of an emergency. Our firefighters are trained to look for these static clings when they arrive at your residence; therefore, it is important to have the static cling displayed on the upper right side of the front storm door or front door window. Knowing your pet’s name can be helpful to our responders since animals tend to hide when they are stressed, so we have provided a space on the static cling for you to write down your pet’s name(s). It is also important to keep the static cling up-to-date with your pet’s name for the safety of our responders and your pet. Lastly, we ask that you please remove the static cling if you plan to move or no longer own a pet. In the event of an emergency, CALL 911. 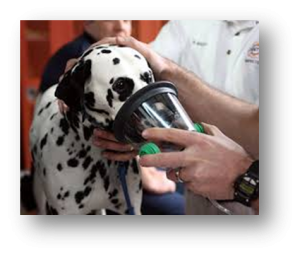 Firefighters will attempt to save your pets! Many times the heroic efforts of firefighters can often lead to saving the lives of some pets, but sadly there are times when pets perish during firefighting efforts. Preventing these kinds of tragedies is important to the Countryside Fire Protection District; therefore, we strongly urge pet owners to “pet proof” their homes and look for potential fire hazards in their homes. Please feel free to stop by the Countryside Fire Protection District – Station No. 2 (600 Deerpath Drive, Vernon Hills) any day of the week if you would like to pick up a free static cling. Should you have any additional questions or concerns, please feel free to contact Tony Rodkey, Public Education Coordinator at (847) 367-5511 ext. 145 or via email at arodkey@countrysidefire.com.